Hundreds of adventurous squirrels live in colorfully decorated houses in Machida Squirrel Garden's spacious outdoor enclosure, sharing their habitat with a couple of friendly giant tortoises. 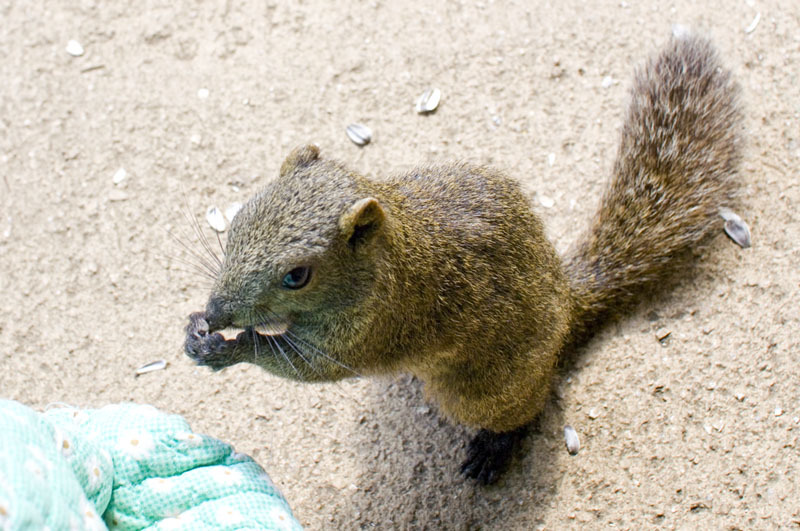 These squirrels are very acclimated to human visitors, and will enthusiastically eat out of your hand, or at least out of the protective oven mitt that you'll be issued along with your Y100 bag of sunflower seeds. Since you're doling out sunflower seeds one by one - the squirrels have to shell them individually - a single bag will last awhile and is a solid investment. We were taken by surprise when some of the more assertive squirrels jumped onto our arms in order to reach the seeds more easily. Long sleeves are recommended. In front of the squirrel zone is a guinea pig village housing at least a hundred guinea pigs, and some fenced-in pens inhabited by rabbits, small tortoises, chipmunks and prairie dogs. A good-sized plate of lettuce and carrots to feed the hungry critters will set you back another Y100, and also lasts a fairly long time.